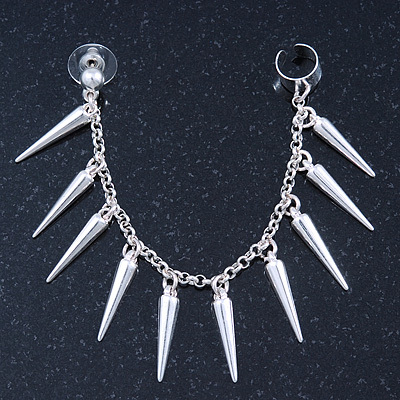 Add a bit of edge to your outfit with this cuff earring featuring spikes. This seasons must have when it comes to jewellery is most definitely the ear cuff, this simple elegant edition with spike detail is perfect for an understated look. Featuring a small stud earring, crafted in silver plated metal and measures about 6mm in diameter. It secures with a push-on back and post fastening. Single oval link, silver plated chain with evenly spaced spikes unites the stud earring with a polished ear cuff. The chain measures about 11cm in length, the spikes have 20mm drop. Comfortable and easy to wear and can be worn on either ear.